The Making of "Freaks": The events leading up to the creation of Tod Browning’s classic film. The events leading up to the creation of Browning’s classic. Original version Copyright © 1973 Mark Frank. This edited version Copyright © 2004 Elias Savada. Used by permission of the author and the publisher. "All that is necessary now, on top of our other trials and tribulations, is to start frightening our child patrons to the point of hysteria." ––Comment by M.A. Lightman, president of the Motion Picture Theater Owners, after the release of DRACULA and FRANKENSTEIN, warning of the possible consequences if Hollywood were to flood the film-going public with "horror" pictures [Late December. 1931]. In the summer of 1931, Irving Thalberg, young production manager at Metro-Goldwyn-Mayer, had been eyeing, as had many other executives throughout the film industry, the phenomenal box-office success of Universal's trend-setting vampire film, DRACULA. Thalberg, sensing a growing "horror cycle" in the cinema, wanted to outdo the rival studios with a "shocker" that would allow M-G-M to become a forerunner in the sound rebirth of that genre on the screen. He asked scriptwriter Willis Goldbeck to come up with an awe-inspiring story more horrible than all the rest. Working with Leon Gordon, Goldbeck soon developed a script that dealt with the extraordinary relationships among the deformed creatures that composed the majority of circus sideshows. Thalberg called Goldbeck into his office after having read the script, with the latter recalling that Thalberg "received me with his head down on his arms on the desk, as though overcome. He looked at me sadly, shook his head and sighed: 'Well, it's horrible.'" The script was that of FREAKS, the basic story of which was suggested from fantasy writer Clarence Aaron "Tod" Robbins' short story "Spurs," first published in the February, 1923 issue of Munsey' s Magazine. Part of the script was also based upon material gathered by Tod Browning, the film's director, during his recent European trip. Browning had known of the story for years through his friend Harry Earles, the German midget who had given a memorable performance as the baby-faced pilferer in the director's exceptional thriller, THE UNHOLY THREE (1925), based on a "Tod" Robbins novel. Cedric Gibbons, chief of the M-G-M Art Department, who as a childhood friend of the author had typed up his manuscripts, also was among those who brought the story to the attention of the studio. Gibbons was responsible for the purchase of "Spurs" by Metro for the amount of $8.000. 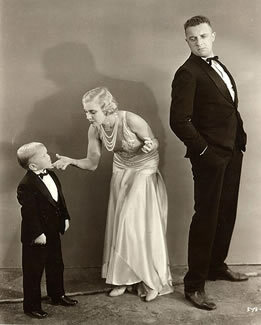 The love triangle in Freaks, consisting of (left to right): Harry Earles (as Hans), Olga Baclanova (as Cleopatra), and Henry Victor (as Hercules). 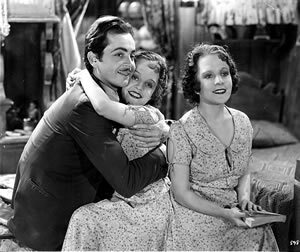 The basic plot structure of FREAKS followed rather conventional lines: the husband finds his wife trying to kill him so she can steal his money and run off with her lover. To this simple melodramatic situation a most unusual background of the circus freakshow, with its strange abundance of curious teratoids, was added. The result was a complete distortion of the original idea, creating new depth to this old story. Set against the backdrop of a traveling French circus, Cleopatra (Olga Baclanova), golden-haired high-wired beauty, scoffingly flirts with Hans (Harry Earles), a circus midget who is overwhelmed by the charms of the magnificent "big woman." When she discovers that her Lilliputian admirer has fallen heir to a fortune, she and her lover, Hercules (Henry Victor), a Cuban strong man, devise a plan by which Cleopatra will marry Hans, slowly poison him, and inherit his money. The other freaks, who catch onto the pair's evil scheming, band together to enact a horrible revenge upon them, forming the film's powerful denouement. In order to give FREAKS the proper directorial care, Thalberg decided upon the only logical choice: Tod Browning. Browning had just finished a three-picture contract for Universal; included was the smash hit DRACULA. Of all the directors in Hollywood, he was one of the few who could stomach such an unusual assignment. From Thalberg's point of view, he had confided in the director six years earlier on THE UNHOLY THREE, which had been hailed from coast-to-coast as one of the most exciting melodramas ever filmed. Add to this the box-office gold that had filled the M-G-M treasury during the blossoming of the Lon Chaney-Tod Browning alliance, which had these two evangelists of the macabre reeling off success after success, and Thalberg felt he would be at least as prosperous with only half of that combination (Chaney having died in 1930). As far as Browning was concerned, he had for some time wanted to direct a picture that would dig into the private lives of the freaks around the sideshow. He himself had worked with many of these people, who were not at all repugnant to him, during the days when he toured with the circus and the carnival. He had run away from his home in Louisville, Kentucky at the ripe age of sixteen years to the lure of the sawdust where, under the canvas of the big top, he made his mark as a clown, acrobat, ringmaster and contortionist. In fact, as part of a carnival troupe, the talented Browning did almost everything from driving stakes to playing the role of "Bosco, the Snake Eater." Even before this circus-bound jackanapes left home, he had the showman's blood running through his veins. When he was a lad (he was born on July 12, 1880), he would charge five pins admission for his playfellows to see shows he gave in the old shed in his back yard at 1433 Jefferson Street. And when he upped his price to the outrageous sum of a penny per show, his young customers still flocked to watch this young Barnum display his dramatic talents before their fascinated eyes. Browning constantly paid tribute to his colorful past in such films as THE SHOW and THE UNKNOWN, two of his 1927 credits. In the former, the prologue offered juicy glimpses of the pleasantries in the Congress of Freaks and Marvels of the World, which included the Spider Woman, the Mermaid, the beheading of John the Baptist (which was the main attraction) and many other delightful items of carnival showmanship. THE UNKNOWN also evinced Browning's preoccupation with sideshow freaks, and the manner in which he built suspense through his knowledge of the life under the circus tent provided him with a notable cinematic coup de force. Invariably, when Browning directed Lon Chaney, he allowed this versatile "man of a thousand faces" to appear in a stunning array of demented characterizations. Among some of those fearful portrayals were: a disjointed Bishop in THE BLACKBIRD (1926); a one-eyed derelict dive-owner in THE ROAD TO MANDALAY (1926); an "Armless Wonder" of a Spanish circus in THE UNKNOWN; and a vengeful cripple in WEST OF ZANZIBAR (1928). While the public "oohed" and "aahed" at each new "face" that Browning gave Chaney, it was, nonetheless, a normal human-being who acted the freak. Yet, is it no wonder that with such a peculiar exhibition of characters and films, most of which originated from Browning's pen, that he was destined to direct real freaks in FREAKS? 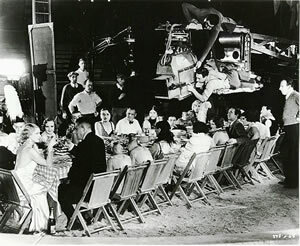 During the initial stages of preparation before actual filming began, Merrill Pye was assigned to draw up sketches of the various sets that the script demanded; Edgar Alien Woolf and Al Boasberg were called upon to add additional dialogue and comic relief to the script; Merritt Gerstad, who had worked as cinematographer on three previous Browning efforts, was preparing his crew; while Browning, aside from helping Thalberg oversee the whole assemblage, was casting the freaks who would eventually appear in the film. Harry Earles and his sister, Daisy, were among the first to be chosen since they knew the director personally and were perfect choices for the roles of the fitful midget and his neglected fiancée. The others had to be picked from among thousands of photographs that cluttered the desk in Browning's office. One of those selected was Schlitze, the Pin-Head, who was a most unusual character. In a conquest of personality, it was claimed that she was a woman, since she dressed like one, but it was also rumored that she was a man. Furthermore, it was said that Schlitze was neither one nor the other. This conflict of identity did not seem to affect her zeal to work in pictures, especially FREAKS, for on any day that she was not scheduled for filming she would make such a fuss at the hotel that they would have to bring her over to the set and let her sit there. She could very well afford this sort of behavior because, being very well managed, she had amassed a sizeable wealth in diamond rings and apartment houses. Violet and Daisy Hilton, the charming Siamese twins in Freaks. Violet has just accepted a marriage proposal from the boy pictured here. Daisy and Violet Hilton, the Siamese Twins, had previously been a hit with a "big-time" vaudeville act, as well as forming their own jazz band. They gave credit to Harry Houdini, the great magician and escape artist, for allowing them to adjust to life and become such a success. Houdini had told them: "Character will accomplish anything for you. You must learn to forget your physical and develop mental independence and you'll get anything you want." Koo-Koo, the Bird-Girl, whose real name was Minnie Woolsey, was among the more grotesque-looking of the freaks, yet she was never bothered by her appearance because she was blind. She first entered show business as a sideshow attraction billed as "The Blind Girl from Mars," and was fifty-two years old when she appeared in FREAKS. As she sat amid the bustle on the set, in silence, a smile of contentment was often seen on her mouth. The most tragic of all these eccentricities was Johnny Eck, the Half-Boy, who simply stopped at the waist-line. Depressingly handicapped, Johnny tried to forget his misfortune by studying art, music and philosophy. He hoped one day to study Law and to become an orchestra leader. He could not wipe from his mind, however hard he tried, the fact that he would never be physically capable of fulfilling those basic needs with which his fellow-man had been endowed: love, marriage, children, and the right to walk. Other members of the pitiful parade that would soon attempt to march notoriously into the local movie theatres included: Prince Randian, the Living Torso, who, with neither arms nor legs, managed to roll his own cigarettes and shave himself through acrobatic undulations of his body; Peter Robinson, who was full-grown yet tipped the scales at a scant fifty-six pounds; Frances O'Conner, a pretty, armless blond from Sheridan, Wyoming; Martha Morris, another armless girl, but with legs only eight inches in length; Elizabeth Green, the Human Stork; and a host of other incredibly misshapen beings. Regarding those pertinent "normal" members of the cast, there were some interesting changes made just before filming began. Myrna Loy was originally to have played the "menace" role which was finally delineated by Olga Baclanova; Jean Harlow, the platinum blonde on loan from Howard Hughes, was announced as the ingénue lead because she could wear tights well. That part was later relegated to Leila Hyams, who had appeared in Browning's first talking picture, THE THIRTEENTH CHAIR, in 1929. Henry Victor and Wallace Ford rounded out the remainder of this segment of the film's company, with the latter playing the romantic lead of "Phroso" the clown, opposite Miss Hyams. The original caption attached to the back of this photo reads: "REHEARSING THE FEAST. Tod Browning rehearsing the fantastic wedding feast of the freaks, in Metro-Goldwyn-Mayer's sensational sideshow mystery drama 'Freaks'." By late October, 1931, carloads of freaks were beginning to arrive at M-G-M studio, much to the consternation of the personnel there, most of whom did not expect such a materialization of "talent." While the newcomers were getting acquainted with their new surroundings, popping in and out of alley-ways, the weak-hearted secretaries went scurrying about in the opposite direction. During those first days of the freaks' immigration, opposition to the production grew to alarming proportions. Louis B. Mayer, executive president, who had somehow allowed this enterprise to slip through his fingers, was now furiously against allowing the project to continue. Many of his executives, spurred on by producer Harry Rapf, were trying to organize a petition calling on Thalberg to halt the ugly venture. Their argument concerned the Metro commissary, where they believed it would become unbearable to dine with Prince Randian or Zip the Pin-Head. Thalberg, having complete faith in his strange little undertaking, stood fast against the barrage of criticism, and continued his ardent support for the film. Within a few days, word came from the higher-ups that the freaks, with the exceptions of Harry and Daisy Earles and the Hilton Twins, were banned from the commissary. In order to accommodate them a private room, especially fitted for them to dine in, was constructed just off the set. Metro also had the cast quartered in a hotel in Culver City, where they were shipped every night as soon as work was over. As filming began on November 9, 1931, the production quickly took on a mysterious "undercover" appearance; the studio was taking every possible precaution to keep the making of the picture a secret. For the most part, the freaks never came into contact with those people not directly connected with the film. Therefore, the number of people who were repulsed by their features was at a minimum. FREAKS' film editor Basil Wrangell wished he was never assigned to this particular production, however, as he commented: "It was bad enough to see them during the day when you'd go down on the set or have to go by their eating quarters, but when you had to look at it on the Movieola for eighteen hours a day, it was enough to make you crawl up the walls." The filming of the panning shot at the wedding feast. Tod Browning can be seen at the far right. FREAKS proceeded with relative smoothness through its nine weeks of shooting. 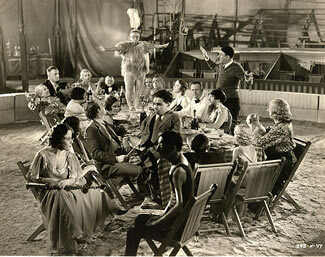 Original shooting actually ended a week or so before New Year's Day of 1932, with the cast and crew working around the clock on the climactic scenes of the storm sequence. Editor Wrangell, meanwhile, had been toiling through the "wedding feast" segment, which took up most of his time. He related: "God, that took 15,000 hours to put together. 'Cause nothing was in sync. That was just a wild track they shot. The whole banquet. And we had to lip-sync all these creatures singing.... We had the whole table and he (Browning) shot groups all the way around the table. Then each one of these had to be put into sync with this already pre-recorded track." When the picture arrived at its preview theatre, which was probably in Huntington Park, Inglewood, or San Diego, it was the first week of January. The film's length was said to be 90 minutes (as compared to the 61 minutes that exist today), and just as quickly as the patrons ran out of the theatre, producer Thalberg rushed back to the studio with orders to add on a "happy ending" epilogue in which Hans, several years later, is seen living in solitude, except for his butler and servants, on the estate that he has inherited. Freida, Hans' former betrothed, returns with Phroso and his sweetheart, Venus. Freida comforts Hans' embittered soul as he breaks into tears, consoling him with a final romantic embrace. This sentimental after-thought, cut in many reissue versions (including those I first watched back in the late 1960s), resurfaced over the last decade when Warner Bros., which now controls the film, struck new prints from its archival material. Armed with a razor-blade, Thalberg did some careful re-editing during the last weeks of January, 1932. The most gruesome episode that he clipped from the preview print was the final decline of Hercules, for while it is all too obvious what happened to his lover, Cleopatra, who appeared on the screen as the shocking "duck-woman," the viewer of the release version could only assume that when he saw Hercules squirming in the mud with a knife in his back, he died. The deleted shots showed a passing implication that the Herculean tower of strength was deprived of his manhood by those same freaks he thought to be without feelings. With the story's return to the dime museum, Hercules is found singing in a tenor falsetto, perhaps some love song to his mutilated Cleo. Some interiors and all exteriors of the London dime museum, known as "Tetrallini's Freaks and Music Hall," which was of the English second-story variety, have been cut, too. In all of the prints that exist today, the M-G-M titles (which mentioned the film's approval by the National Board of Review) have been replaced by a printed roller prologue ("Before proceeding with the following HIGHLY UNUSUAL ATTRACTION, a few words should be said about the amazing subject matter..."), which was added to the post World War II-Dwain Esper reissue. On Wednesday, February 10, 1932, the truncated "revised version" of FREAKS, half-heartedly lauded by M-G-M as a bold and novel concept in film-making, premiered at the Fox Criterion in Los Angeles. While the feature was aimed at a bull's eye at the great god Box-Office, the result was a distinct failure. In two weeks, FREAKS died in Los Angeles, as it would in Chicago and New York during the months that followed, leaving a trail of wreckage in its wake. Yet, strangely enough, the film quickly built up its own unique reputation, surprisingly grossing five times the normal at Cincinnati's UFA-Taft. At Minneapolis' State Theatre it sent the take of that house a thousand dollars above average, even with a barrier against children. In Buffalo, while the Mills Brothers packed the Buffalo Theatre, the draw of FREAKS was the talk of the town, as it grossed twice the average of the Court Street Theatre during its brief four-day stay. This phenomenon also appeared in such cities as Boston, Cleveland, Houston, St. Paul, and Omaha. These minor box-office victories were unfortunately unable to offset the film's sinking receipts in the rest of the country. In Kansas City, FREAKS sent the Midland Theatre's gross to a new low, despite big exploitation and advertising. The Atlanta Board of Review prohibited the picture from making its scheduled run at the Fox Theatre, even after $2,500 had been spent promoting it. This particular case was carried to the courts on the Saturday morning before the opening engagement of the picture that afternoon, with the judge ruling that its exhibition would violate a city law. At the Paramount in Denver, it replaced NEW MORALS FOR OLD, which had limped through three disastrous days, only to fare little better than a few thousand dollars in a theatre that averaged just under $9,000 per week. The disparity of the film's press reviews was astonishing, ranging from outright condemnation to a subtle warning to exhibitors to shy away from this touchy piece of merchandise unless they had "the courage to go through with a play date." Almost all the reviews had this in common, an attempt to keep the younger patrons' morals from being corrupted by the "shock" nature of the picture. Harrison's Reports commented: "Any one who considers this entertainment, should be placed in the pathological ward in some hospital. Terrible for children or for Sunday showing." Richard Hanser of the Buffalo Times echoed this warning with: "While the story may tax the credulity of the onlooker, it has the fascination of the horrible. It must surely be a nightmarish spectacle for children and they had better be kept away." Similarly, The New Yorker chimed in with: "I don't think that everyone on earth should see it. It's certainly not for susceptible young people." In the Kansas City Star, John C. Moffit's caustic wordplay nearly burnt through the printed page with: "There is no excuse for this picture. It took a weak mind to produce it and it takes a strong stomach to look at it. The reason it was made was to make money. The reason liquor was made was to make money. The liquor interests allowed certain conditions of their business to become so disgraceful that we got prohibition. In 'FREAKS' the movies make their great step toward national censorship. If they get it, they will have no one to blame but themselves." Harold Heffernan did not know just how right he was when he told the readers of the Detroit News that: "No such film has ever been produced before. It is reasonably certain that nothing like it ever will be attempted again." One of the few critics who provided a rare insight into a film he believed was truly a masterpiece of the macabre was Richard Watts, Jr., of the New York Herald Tribune. He noted that "his (Browning' s) other pictures seem but whimsical nursery tales . . . It is obviously an unhealthy and generally disagreeable work, not only in its story and characterization, but also in its gay directorial touches. Mr. Browning can even make freaks more unpleasant than they would be ordinarily. Yet, in some strange way, the picture is not only exciting, but even occasionally touching." In the same manner in which the film entered New York, it left in a whimper three weeks later. With the exception of several uneventful screenings in Europe, it crept into 30 years oblivion in the United States and the United Kingdom, the latter having banned the film until May 10, 1963. For almost three decades FREAKS lay dormant until its resurrection as the official "horror" entry at the Cannes Festival Repertory in 1962. It soon began to attract some attention in France and the United Kingdom, and was revived in the United States one year later, a year after its long neglected and forgotten creator had suffered a fatal heart stroke. While Tod Browning, and to some extent Irving Thalberg, can only posthumously and belatedly be honored with the knowledge that their macabre sophistication was not at fault, but rather many years ahead of their time, fitting homage is paid to Browning by many contemporary audiences who continuously salute his creative abilities. FREAKS is nowadays constantly applauded by most of those who see it, prompting many to praise it, among them, Vincent Canby of The New York Times who called it: "one of the perhaps half-dozen great horror films of all time." This is the ultimate irony; that FREAKS was able to return after its long absence so that its beautiful study of the 'ugly' in life could be recast in a mold of timelessness.